If you’re in the Big Apple this Memorial Day weekend, you will get a visit from “Manhattanhenge.” For those uninitiated, Manhattanhenge is a phenomenon that happens twice a year, wherein the setting of the sun aligns perfectly with the gridded streets that run east and west throughout New York City, specifically in the Manhattan. The result is an incredibly unique visual that casts a warm red glow throughout the streets that are usually lit with nothing more than ambient light during the setting of the sun. 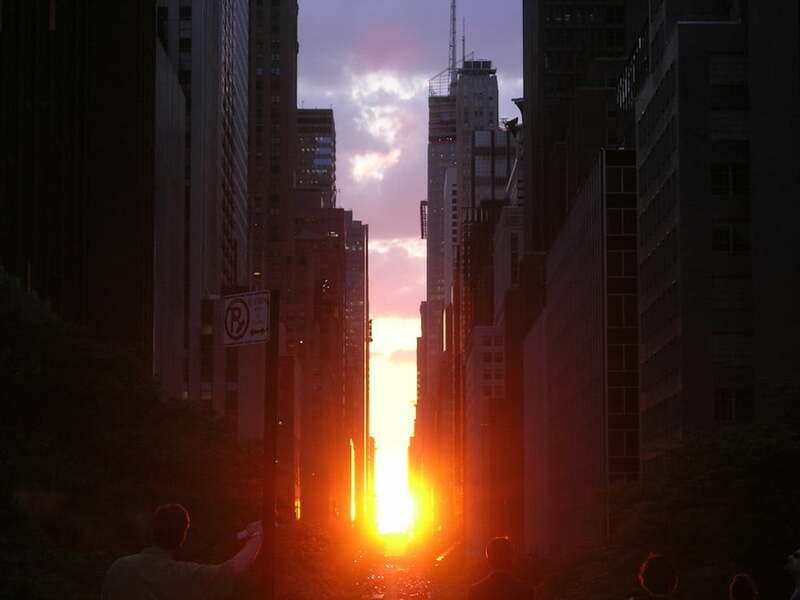 Year to year, the days on which Manhattanhenge falls varies, pending the summer solstice. This year, the two-day event will take place on Sunday, May 19, and Monday, May 30. Over the past few years, the event has drawn many spectators, many of whom have their cameras in hands ready to capture the incredible scene. As such, if you plan to photograph the spectacle, there are a few things you should keep in mind. First, bring a tripod or monopod if you plan on using more than a smartphone. Not only will this let you capture long exposures of the event, it’ll also give you a bit more reach in the event you need to shoot over the other visitors, who will inevitably have their cameras held up above their heads. Just remember, be courteous when using the tripod and don’t place it somewhere it shouldn’t be. Try to not take up more space with a tripod than you would if you weren’t using one. Second, experiment a little. Sure, you can follow many of the traditional rules, such as using streets and accompanying buildings as leading lines. But also look for more interesting angles. See if you can utilize reflections or other objects to frame the event. It not only lends context to where you captured the photo, it’ll also make yours stand out from the thousands of other photos that will inevitably be taken. Third, enjoy the event. Sure, it happens multiple times every year, but so many times we’re caught up in capturing it for Instagram or Snapchat that we forget to experience it with our own two eyes. Take a few photos if you’d like, but once you have the ones you want, put the camera down and enjoy it through the two lenses within your skull.